People ask me about how to deal with singing hoarseness all the time, and I have written about it before. If you don’t know the simple singing techniques and singing mindsets that can prevent hoarseness to begin with, you will repeat the same patterns that caused you to look for help for singing hoarseness to begin with. Right? 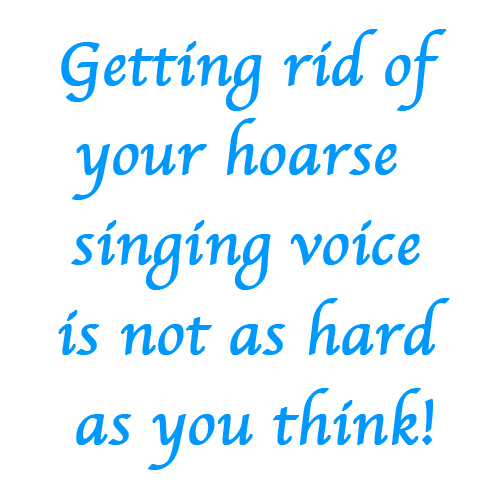 Make sure you get good vocal training from a voice professional who does not get hoarse themselves! Seriously, I’ve seen too many ads from so-called “experts” who do more damage than good that I just had to say that. There… that’s now off my chest Whew! Honestly ask yourself what you are willing to do to get the help you need and deserve. If your car isn’t running would you try to fix it yourself without anyone helping you, even though you didn’t know a hex key from a hatchet driver? Of course not! You would take it to the best and most honest mechanic your could find. So think of your voice the same way. Get the best and the most honest help you can get to protect and maintain the most valuable tool you have: YOUR VOICE! Then we can take the next step to find out if I am the best fit for you because there is absolutely no “one-size-fits-all” when it comes to the voice! In the meantime, be sure to read more information about singing hoarseness. Most of all, take your voice seriously. I do! I feel badly that I didn’t see you comment until now. I’ve been out reach due to a major move in August-December back am back and operational again now. Thankfully! Anyhow, if you have not yet found the person you are looking for to help you with your voice, I’d be happy to correspond with you further about possibly helping you. And even if you have found someone else, I’d be happy to answer your questions here. I spent most of my childhood & teenage years in music, singing & having a great voice teacher. I was in several choirs also. I never had issues with being hoarse after singing, even after hours of singing. I’m now in my early 40’s, I mostly sing in my car these days but, I’ve found over the last few years I get hoarse after I sing 1 song or 10. I do have allergies & post nasal drip, it has lead to a lot of throat clearing when it isn’t controlled. My church would like me to join the choir there, I still have a pure sound & good breath control but, I worry about being hoarse & sounding sick all the time. Do you think all the throat clearing has damaged my chords, I’m just out of practice or something else is going on I should have checked? I really miss singing & sounding normal after. I want personal help now and am ready to pay for it! I wonder if we could talk and see if it’s a good fit? I have been singing for many years, but I now (I’m in my mid-forties) often get hoarse after singing for even just 45 minutes (more when the songs are higher), and I have a hard time singing freely in my high range. I lead a community choir and sing in a duo with my brother, and it’s so important to me to free my voice and share it with the world! Thanks for your thoughts. Apologies for not getting back to you. I’ve been in the middle of a major move to the East Coast. I can call you, if you like. I will email you privately and work out the details. If you don’t see my email, search for something from joy@singing mastermind.com.